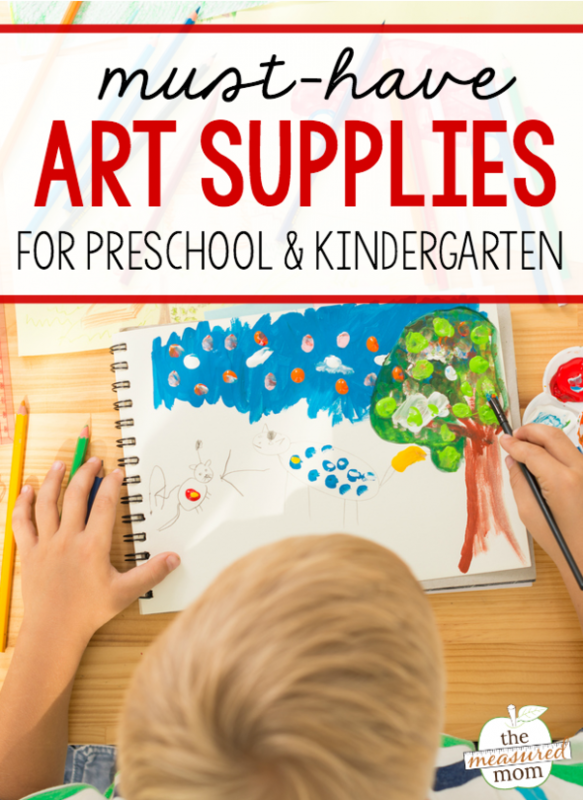 Here are our must-have art materials for preschool and kindergarten! Are you looking for the best art materials to have on hand for preschool or kindergarten? Whether you’re at home or in the classroom, you’ll find the best of the best in this list of must-have supplies! Kwix Stix are the new art supply that everyone is talking about … and no wonder! If you’ve ever cringed at a painting mess, you need to get a set of these solid tempera paint sticks. Kids apply paint like they’re using a glue stick – and it dries in 90 seconds! No spilling, no water, no mess. And you can’t beat the variety of vibrant colors. Click on any of the above images to order a set for school or home. Bonus! You can use Kwix Stix on wood, canvas, poster board, and many other media. Shopping at Target? Find Kwix Stix next to the art supplies. As much as I wish we could stick with Kwix Stix and avoid the mess all the time, kids need to experiment with a variety of art supplies. We pull out our washable tempera paint at least once a week. Here are good paint brushes. Occasionally we grab the finger paint and watercolors, too. Crayola crayons, markers, and colored pencils are the very best. That’s why I recently bought an entire case of each – just for home! These giant sets are perfect for classrooms (and big families whose toddlers are hard on art supplies). I know we’re talking about art supplies here, but The Pencil Grip is a must for kids learning to hold their tools correctly. It fits right on pencils, crayons, colored pencils, and even skinny markers. Plus, it comes in three different styles for different levels of support. If you think about it, it makes sense to use the pencil grip on art supplies before teaching kids to write their letters using a grip. Learning to form letters and hold the pencil correctly at the same time can be overwhelming. Why not teach kids to hold their tools correctly while they’re doing something they already know (and love) – coloring! As a teacher, I bought an entire classroom set of the The Original Pencil Grip (out of my own pocket) because I knew these were the very best grips for helping kids hold their tools correctly. I love that you can get additional styles, now… like the crossover grip – to help kids who tend to cross one finger over the other. The Crossover Grip prevents children from crossing over fingers. The Pinch Grip allows children to see the way they’re holding the pencil while still providing some structure. The Original Grip provides freedom while maintaining comfort and control. I seriously can’t recommend these enough for school or home! Ultimate art paper is a great purchase because kids can use it for drawing, painting and collages. Of course you’ll also want to have some sturdy cardstock (we use ours almost every day), a large supply of construction paper, and a stash of tissue paper for special projects. Truthfully, I avoid glue bottles whenever I can and opt for glue sticks instead. But we pull out our trusty school glue when we need it. For tougher gluing jobs, this is our favorite tacky glue. Do-a-dot markers – Even though they’re messy and can stain clothing, we use them nearly every day (with extra supervision). Instead of using them for traditional art projects, we use them with our learning tools. 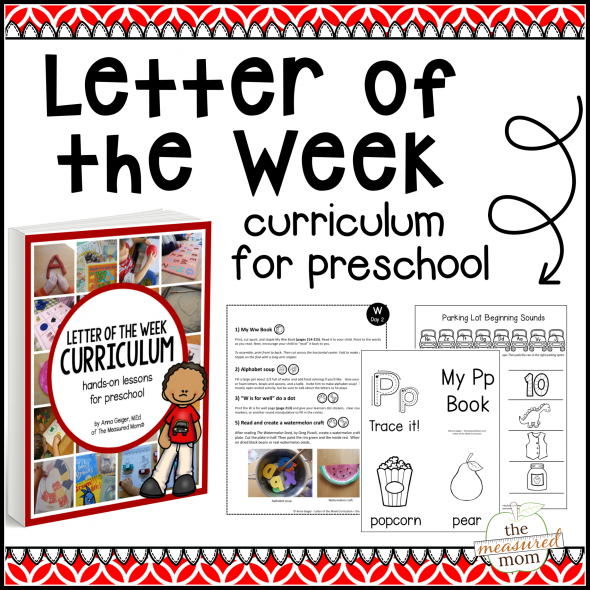 Try them with our dot sticker pages, letter find pages, Math bingo games, and more! Googly eyes – Can you ever have too many? Pom poms – Not just for crafts! Get fun pom pom ideas here. Craft sticks – Not sure what to do with this classic craft item? Get some inspiration in this post. Glitter – Okay, truth. I don’t like glitter. It’s not allowed in my house. But if you can be a little less Type A, your children will thank you! Play doh – Does play doh count as a craft item? It’s certainly a tool for creativity, so we’ll go with it. 😉 Choose from over 100 free play doh mats to use with your stash. Pipe cleaners – These colorful, bendy stems have so many possibilities… here’s some inspiration in case you need it. Craft jewels – Add some bling to your art projects with these fun little gems. Did I leave anything off the list? Let us know below! Win a set of Kwix Stix and a Pencil Grip training set! © 2016, Anna G. All rights reserved. I definitely need to get some Kwix Stix. My 2 year old loves to do projects. A less messy option would be great! I’m adding that to my Christmas shopping for sure! My 7 year old would love to have some Kwik sticks. That way he won’t have to ask me for permission before painting. The kwik sticks. My boys love coloring and painting. My 7 year old nephew would think these were the most amazing thing ever! Thank you for sharing. I really need the Do A Dot Art! Markers ! The pencil grips because I am a fanatic about that. The paint things just seem like markers to me. Maybe if I saw them in use I’d get it but I don’t see the difference right now. The Kwix Stix look amazing!! They would be perfect for my six year old daughter who loves to paint: she would get to pain a bunch more because I would not have to worry about a mess! And I would love to try them with my four year old son. He will not paint because he does not like the mess that normally goes with it, but maybe with these he would give painting a try. I’m most excited about trying the pencil grips to correct my son’s grip. It’s nice when you can find a product to aid in fixing an ongoing issue in a positive way! As a kindergarten teacher, I could use ANY of the the art supplies, but I’m most excited about the pencil grips and Kwix Stix. Many of my students struggle holding a pencil so the pencil grips would be very helpful and the paint issue. Oh man! I’d love some fast dry paint! The pencil grips sound like exactly what my little one needs. Thanks for the giveaway! Thanks for sharing the list and telling us about the Kwix Stixs. We already own the pencil grips (thanks to a previous recommendation from you). So, we’d love to try the Kwix Stix. Thanks for the reminder to get the paint out and let my kids create! We have a kwix stix set! Love them! Need to replenish though as most of our colors are almost gone. Those Halloween pumpkins really used up the orange for sure! I love both of them. These sound very cool to use!! I need Kwix stix. I shook a bottle of paint to mix it and when I opened at 8:10am I covered in a spray of red. I had to go the whole day with a red tint on my face and ruined clothes. 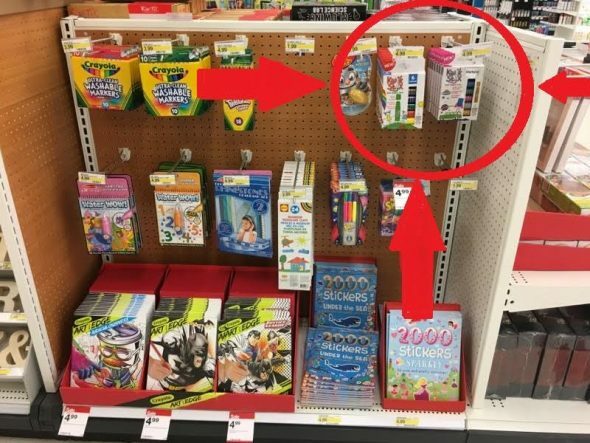 I also liked that you showed a picture of where to find them in Target. Love those grips! Thank you for the giveaway! I am very excited about the Kwix sticks, they are new to me and with a 3 and a 4 year old they would make our life easier! My 3 yo and 2 yo would love Kwik Stix! They have only painted at the homes of friends because I can’t stand the extra hassle and mess! I love the pencil grips for my fourth grade resource students. It helps them hold their pencils in the right position with an appropriate amount of pressure to produce smoother more legible handwriting. The added bonus of minimizing hand fatigue keeps them writing longer, which is good for everyone. I am guessing that since the grips are great products, the kwix stix are super cool products too! I am really excited about trying them out in my classroom for art and then seeing where they can replace other products that we may be bored with. I am most excited about the Kwik Stix. My kids love to paint, so I think this would be a great addition to our art tools and it would give a new spin on painting! Thank you for sharing. I have heard of Kwik Stix but have yet to try them. There is certainly something to be said for the sensory experience of painting but the idea of less clean up is very appealing on some days. Cotton balls and beads are additions to my art supplies. I love the idea ofKwik Stix for my 18 month old! My children LOVE anything art! Give them some paper, crayons, glue sticks etc…they will sit for hours! Their favorite medium right now is water paint. However, my daughter has showed a great interest in finger paint. I know all of my kids (4, 5, & 9) would love the Kwik Stix! The pencil grips would be very helpful for us too. I have never even heard of Kwix Stix! I so need these because I usually freak out about paint messes! I really should get the pencil grips for my boys too, as I’ve been a bit lazy about teaching them proper grip. You’re awesome! I would love to have the pencil grip training set to help my daughter with her pencil grip. I am so excited to try the Kwix Stix! With a class of 27 Kindergarten students, we make messes easily! I am so excited about the kwix stix because my preschool class would love them. I have personally used pencil grips, they are important but not exciting for most students. Kwix Stix !!! So cool. My 2 boys will love them. I don’t know if you can send them to France. But it’s also the occasion to tell you that I’m always eager to read your newsletters. I’d love to try to Kwix Stix, I’ve never even heard of them! My 4-year-old loves to paint. I’m sure he would love if Mama let him paint more often, with something less messy like Kwix Stix. I hate paint everywhere! We do use the pencil grips already and they do help. I’d love to have the pencil grips for the Children’s Reference desk at my library. My daughter would love the Kwix Stix, and I would love the fact that they are mess free!! Those Kwik stick sound awesome!!! They will be great for my 2 year old. My 3 year old might benefit from pencil grip, too! My students would love these! My kids would love the Kwik Sticks and also the pencil grip. My oldest has issues with holding pencils correctly so this would be a big help!! I am excited about the pencil grips. Constantly trying to get my kiddos to hold pencils correctly. Would love these! Great list! I love art supplies. I may have an addiction. I haven’t used pencil grips before, and I think they would help my little ones. Thanks! Wow, great giveaway and my 6 yr old twin boys would love to use the kiwk sticks! Thank you for the opportunity. KwikStix…what a great new product! Thanks for sharing!!! I would really like to try the Kwix Stix. Thanks for the giveaway, Anna! I have heard great things about Kwik Stix. I would love to give them a try. Loved the pencil grips! A few of my 4 year old students still struggle to with their grips. Thanks for sharing the new grips that I had not heard of. Would love to win a set for my PK classroom. Oh my goodness! I would love the opportunity to use Kwik Stix with my Special Ed students. I have tried so many different tools, products, methods, and measures to allow my students the experience of painting, but they always end in disaster! No, really, DISASTERS!! I am looking for a magic solution to the paint disasters and Kwik Stix just might be the answer. I cant wait to try the new paints. I use about everything else y ou mentioned. I would love to win the paints and pencil grips! I think I am most excited about the Kwik Stix. I’ve not had the chance to try them yet and they sound Amazing! Two very valuable giveaways. Most kind of you to arrange this for readers. The paint sticks were new to me. How clever. And we do not have that brand of pencil grips. Eager to give both a try. We don’t paint as often as I’d like because it’s just so messy! So I’m excited about the Kwik Stix. Thank you for the opportunity to win! We love hands-on projects here! My boys will love to have the 12 -pack of Kwix Stix! They are so much fun and it’s a quiet activity they both can do during our quiet time. The grips look great – I have so many friends that can’t figure out that grip this year…. I keep seeing these everywhere, I would love to try them! I’d love to try the kwix stix! Been hearing so much about them! I would like to try the pencil grips with my oldest – she has recently started putting her thumb all the way around her pencil! I’m excited about both the prize! My daughter is 4 and she is loves art so much and wants to be an artist when she grows up. I’m sure she will love the set of Kwix Stix to create colorful & wonderful art. a She will be starting kindergarten in few months. As a mom I love a Pencil Grip training set which will help the little hands to get started with writing in a fun n safe way. Thanks for the lovely ideas, reviews and giveaway!